Sometimes you need to find out whom a particulat workflow task belongs to or other way, which workflow tasks belong to a specific user. 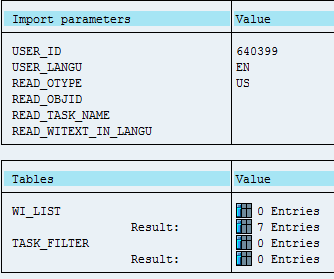 To find out pending tasks of a specific user you can simply read table SWWUSERWI passing USER_ID as a parameter. For example let’s assume we have a workflow with name WS90100079 and there is a “Decision task” in this workflow with name TS90100211. A new instance of this workflow has been started with key (instance ID) ‘ABCD123456’. Now we need to find out in our program the agent responsible for processing this task…how to do it? We will get the user(s) responsible for processing the workitem we got in step 2 … there might be more users responsible and all such users will be listed. 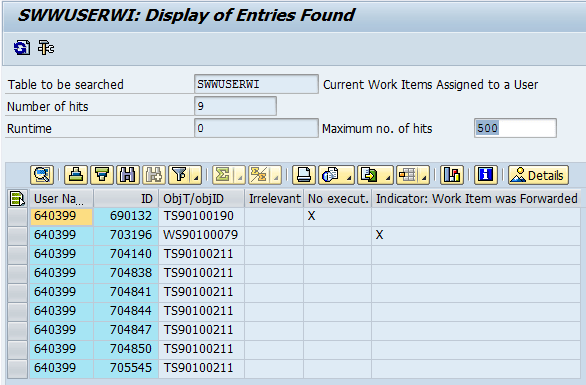 This entry was posted in ABAP, Development, Wokflow and tagged ABAP, RH_LOCAL_INBOX_GET, SWW_WI2OBJ, SWWUSERWI, SWWWIHEAD by Spider. Bookmark the permalink.